Valentine’s Day is the biggest day for dining out, often outbeating New Years Eve and Christmas. It generates the highest traffic day on Zomato at a rate of 61% higher than any other day in the year. Couples are going out of their way to make Valentine’s Day just perfect. While most couples in Delhi, Manila, Dubai, Auckland and London would treat their partners to an evening meal or dinner, Valentine’s Day lunchtime traffic shows a spike in Johannesburg. 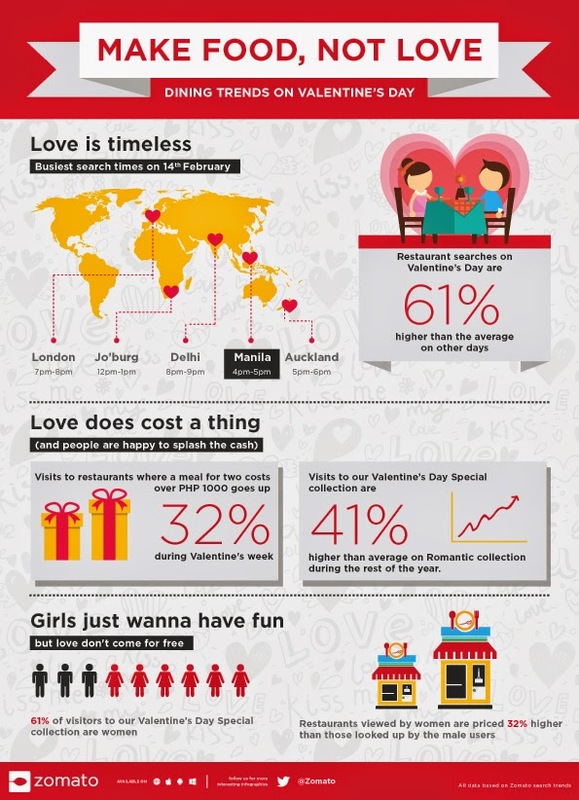 Trends also show that women Zomato users dominated the male user base in Valentine’s special collection. Women do tend to like Valentine’s day, and take charge searching for more romantic places to dine in compared to men. They viewed restaurants priced 32% higher than those looked up by the male user base. Love, it turns out, doesn't just require warmer hearts. It requires deeper pockets too.